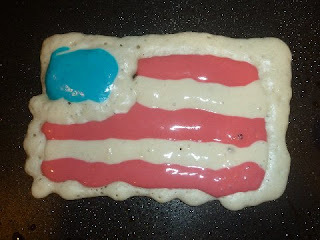 Google+ Mom to 2 Posh Lil Divas: Memorial Day Flag Pancakes! 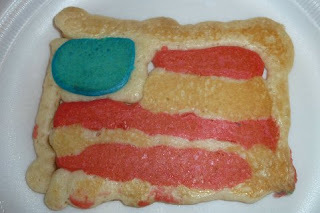 We started our Memorial Day with some yummy & fairly easy to make festive Flag Pancakes! 1.Take a small amount of pancake batter and mix in blue food coloring - you only need a small amount for this so it depends on how many pancakes you plan to make but I used only about 2 spoonfuls for this section on each pancake. I did not use a squeeze bottle for this - just a spoon. 2. The rest of the mixture should be divided between the red & white (uncolored) batter. You will need a bit more of the white so I divided in half by eye and then took a bit more to leave uncolored. I put the uncolored batetr into 1 of my squeeze bottles. The added red food coloring to the remainder of the batter, mixed & added it to 1 of my squeeze bottles. I used a griddle to cook these & kept it on fairly low - it's important to let it cook pretty well before flipping or you will not end up with a good flag! 1. Make the flag outline using uncolored (white) batter. I just made a large rectangle shape and then the smaller inside square as well. 3. Alternate making stripes between your red and white pancake batter. 4. Be sure to let it cook until it is mostly firm before flipping. You have some cute Flag Pancakes! These look soo good. Very creative!! No way! 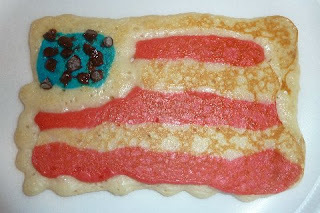 You made Flag Pancakes?!?! Brilliant! Whatever will you think of next!!!! Thank you again for linking to Kids Get Crafty! What a great (and easy) idea! Love it! Those are awesome! Thanks for sharing at For the Kids Friday! I have passed this one onto my Facebook friends. :) Always happy to have you linking up! How cute! I will definitely have to do this on 4th of July!